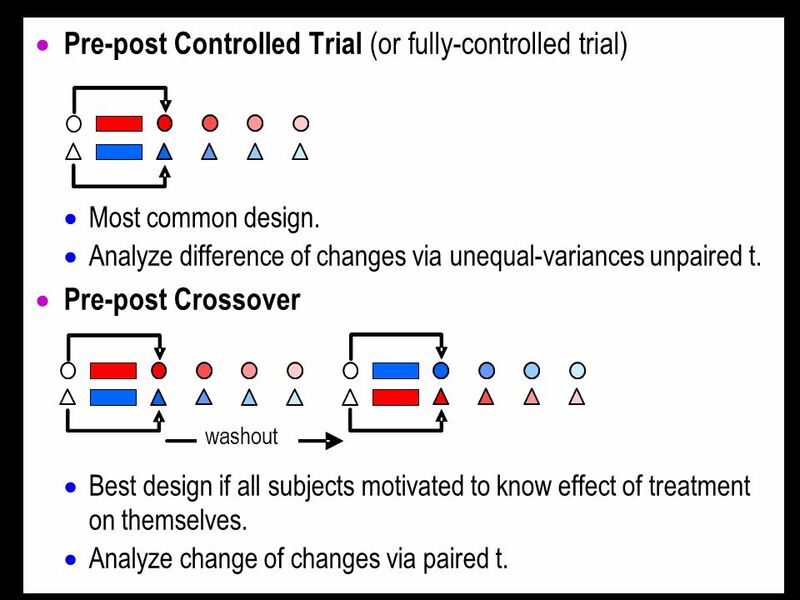 Controlled-Trial Designs See Batterham and Hopkins, Sportscience 9, 33-39, 2005. Choice determined by availability of subjects, reliability of dependent. 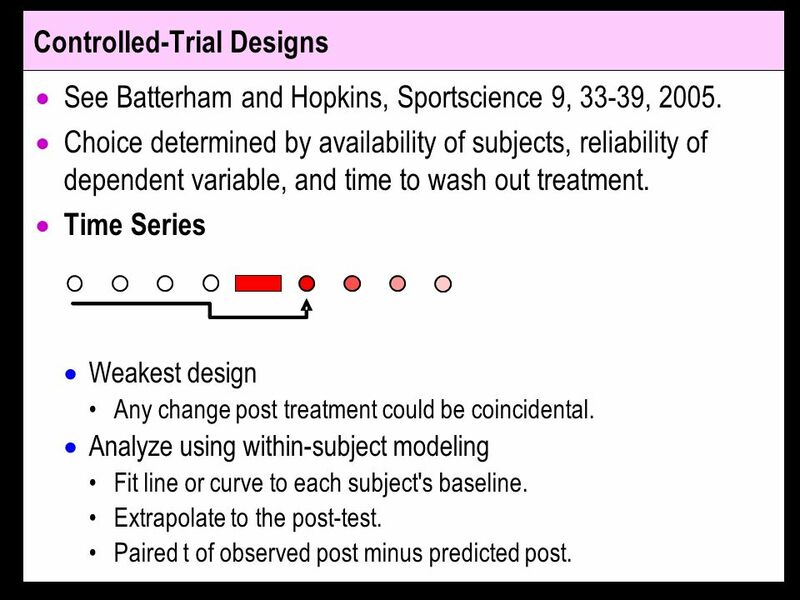 1 Controlled-Trial Designs See Batterham and Hopkins, Sportscience 9, 33-39, 2005. 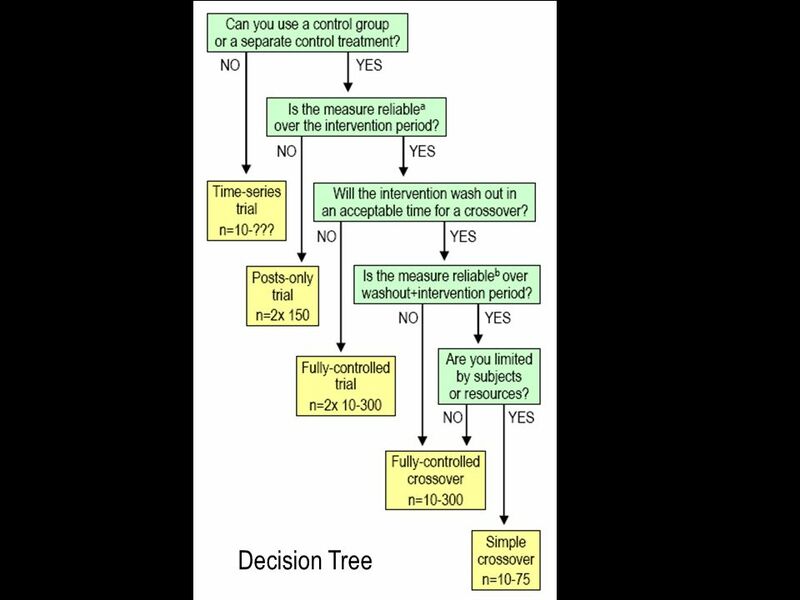 Choice determined by availability of subjects, reliability of dependent variable, and time to wash out treatment. Time Series Weakest design Any change post treatment could be coincidental. Analyze using within-subject modeling Fit line or curve to each subject's baseline. Extrapolate to the post-test. Paired t of observed post minus predicted post. 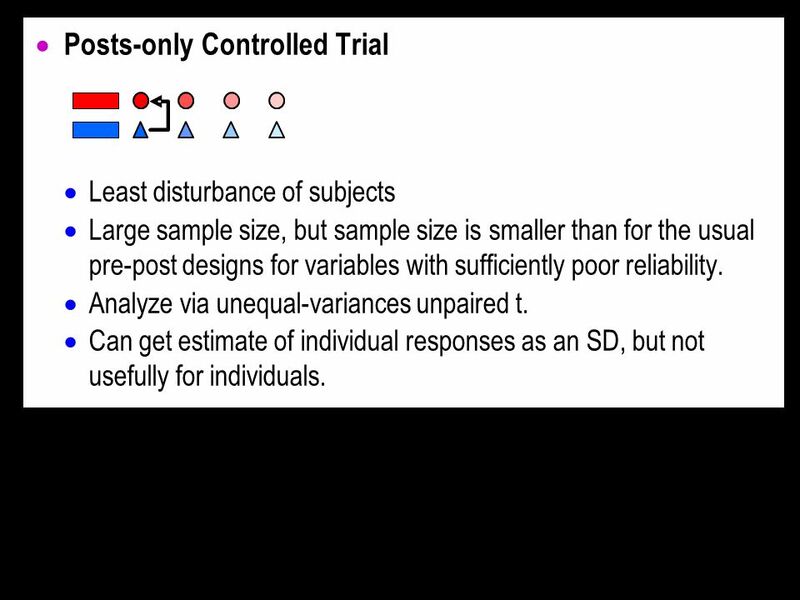 2 Posts-only Controlled Trial Least disturbance of subjects Large sample size, but sample size is smaller than for the usual pre-post designs for variables with sufficiently poor reliability. Analyze via unequal-variances unpaired t. Can get estimate of individual responses as an SD, but not usefully for individuals. 6 Time-series trial n=10-??? 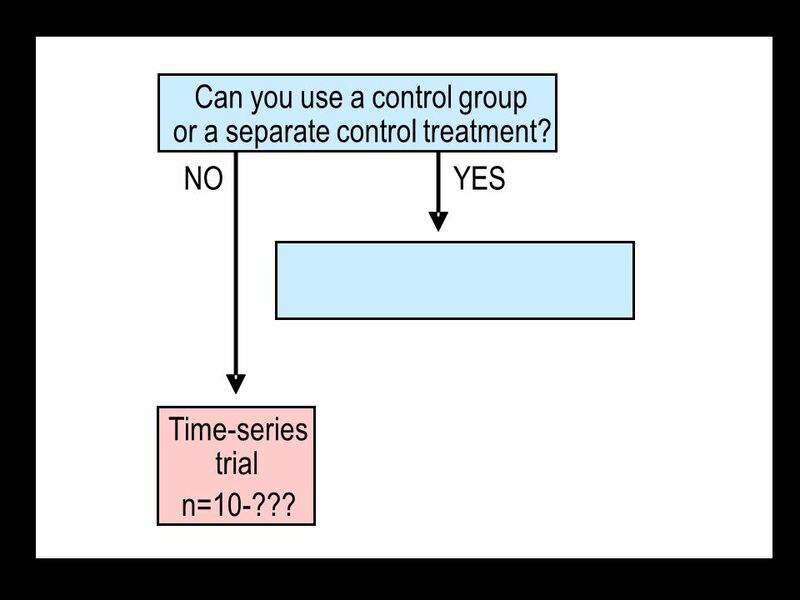 NOYES Can you use a control group or a separate control treatment? 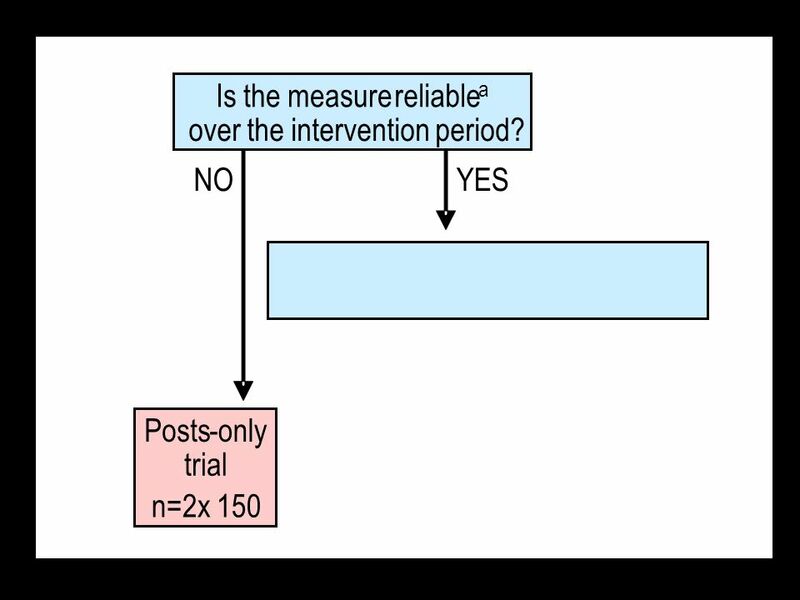 7 Posts-only trial n=2x 150 NOYES Is the measurereliable a over the intervention period? 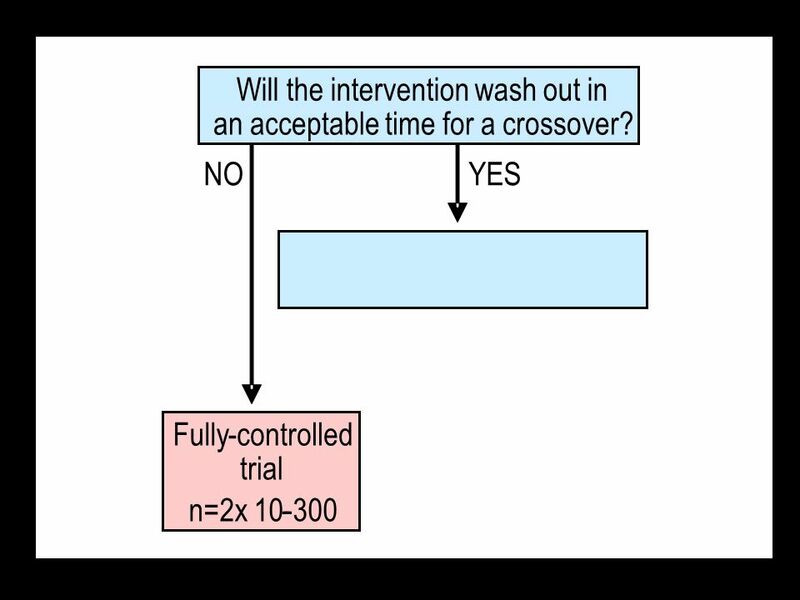 8 NOYES Fully-controlled trial n=2x 10-300- Will the intervention wash out in an acceptable time for a crossover? 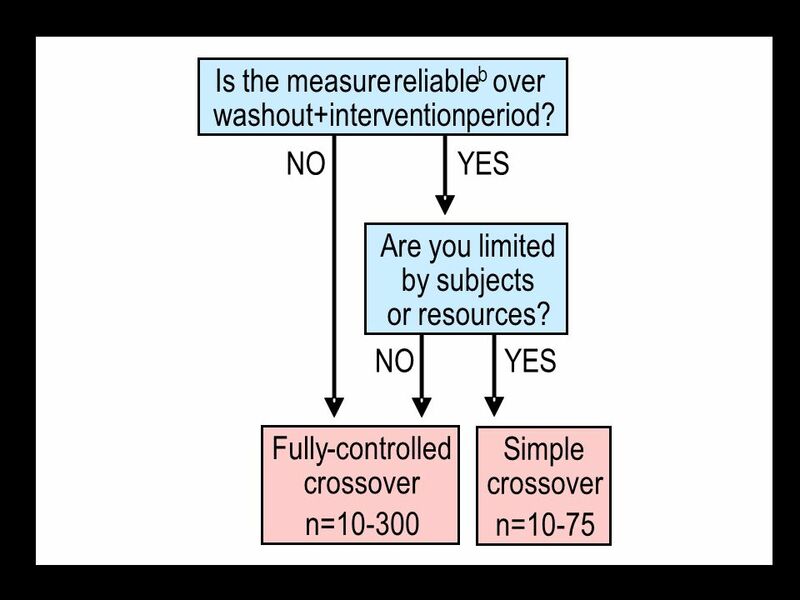 9 Simple crossover n=10-75 Fully-controlled crossover n=10-300 NOYES Is the measurereliable b over washout+interventionperiod? NOYES Are you limited by subjects or resources? Download ppt "Controlled-Trial Designs See Batterham and Hopkins, Sportscience 9, 33-39, 2005. Choice determined by availability of subjects, reliability of dependent." 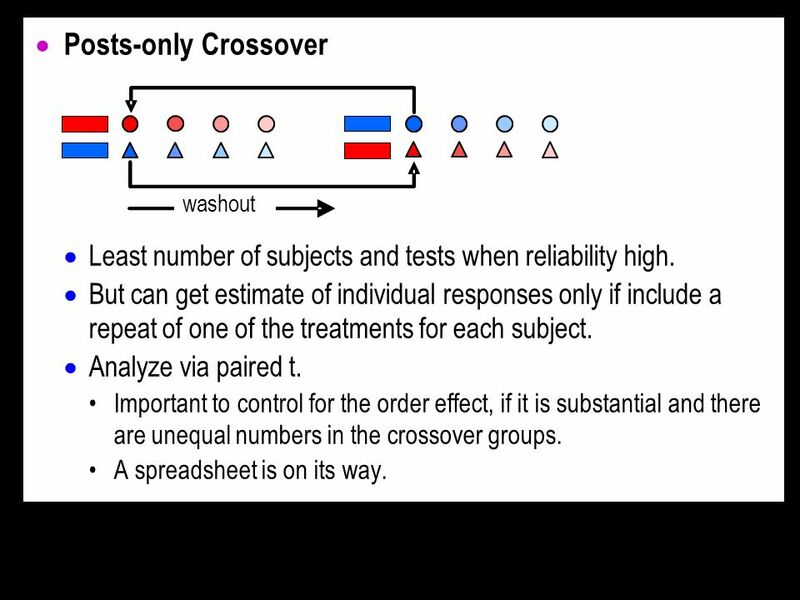 Covariates in Repeated-Measures Analyses Repeated Measures What change has occurred (in response to a treatment)? Mechanism Variables How much of the change. HYPOTHESIS TESTING. Purpose The purpose of hypothesis testing is to help the researcher or administrator in reaching a decision concerning a population. Chapter 9 Choosing the Right Research Design Chapter 9.